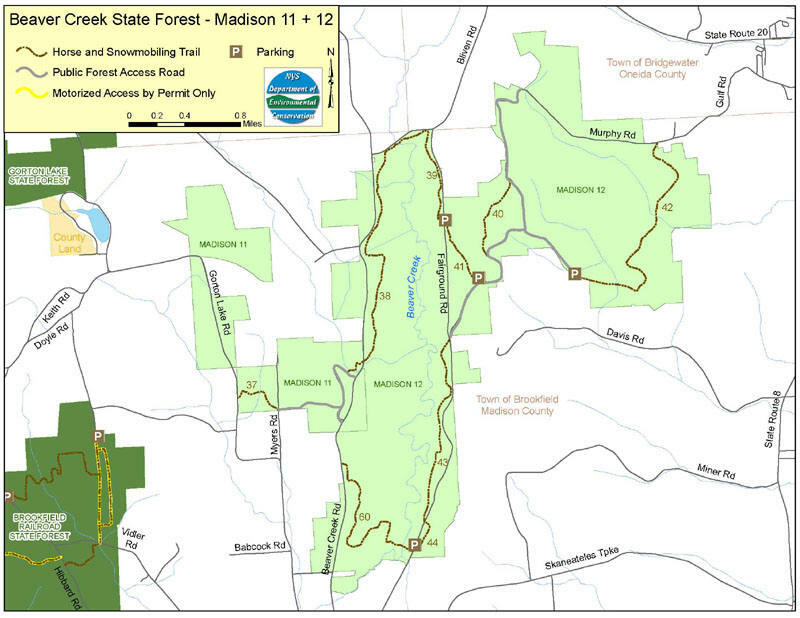 The 3484 acre Beaver Creek State Forest features the northern section of the Brookfield Trail System which is located in southeast Madison County. This highly acclaimed horse and snowmobile trail system has over 100 miles of trails through five state forests. These trails can and are also be used by hikers. Be sure to check out the popular Brookfield Swamp Loop hike . Beaver Creek passes through the heart of this State Forest. A canoe or kayak trip through these still waters is reminiscent of scenes from the wild areas of northern New York. Once home to a brick kiln along the east shore of Beaver Creek, today the area shows very little evidence of human intrusion upon the landscape, outside of the trail network situated around the swamp's perimeter. The swamp may be viewed from the bridge crossing the creek. Visitors to this area have many options for outdoor recreational activities. The Brookfield Trail System covers approximately 25 miles within this State Forest, which is open to hiking, horseback riding and snowmobiling during the appropriate seasons. Fishing, hunting and canoeing provide other recreational opportunities in the state forest. To access the forest from US 20, take NY 8 south from Bridgewater approximately 3.5 miles to Skaneateles Turnpike (County Route 80) and turn right. Proceed 4 miles west to the village of Brookfield. Turn right onto Fairgrounds Road and look for State land on both sides of the road approximately a 1/4 mile past the Madison County fairgrounds.